Bathgate’s Louis Gaughan is the new Scottish Par 3 champion after claiming his first pro success in style. 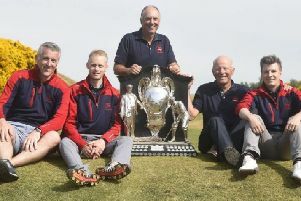 The 23-year-old birdied the first extra hole in a play-off with two-time European Tour winner Alastair Forsyth to win the Aberdeen Asset Management-sponsored event at the Paul Lawrie Golf Centre. Gaughan posted rounds of 53 and 51 for a four-under-par total at the Aberdeen venue before claiming the £3250 top prize with a birdie from four feet in the shoot-out. “It was a great yardage into the wind,” said Gaughan of his majestic blow at the 160-yard ninth hole on the Devenick Course. The Livingston man joins Eric Brown, Bernard Gallacher and Stephen Gallacher on Bathgate Golf Club’s list of professional winners. Gaughan celebrated his success by jumping in the car to make a near 500-mile journey to Collingtree Park in Northamptonshire for the start of a PGA EuroPro Tour event today. “I guess this makes the journey a bit more bearable,” he said, smiling.